Many students will be graduating end of this year, and if you are one of them, you definitely will need to use an Application Forms. The preliminary goal of an employment form is to allow you to express your interest in a job without spending too much time on form design. Moreover, the forms, developed by professionals in the job market, are standard for any job application, hence suitable to use whenever you want to apply for a job. The form enables you to express your interest in whatever job you like. The form is short, which means it won’t take you a lot of time to go through. It is also easy to fill out. 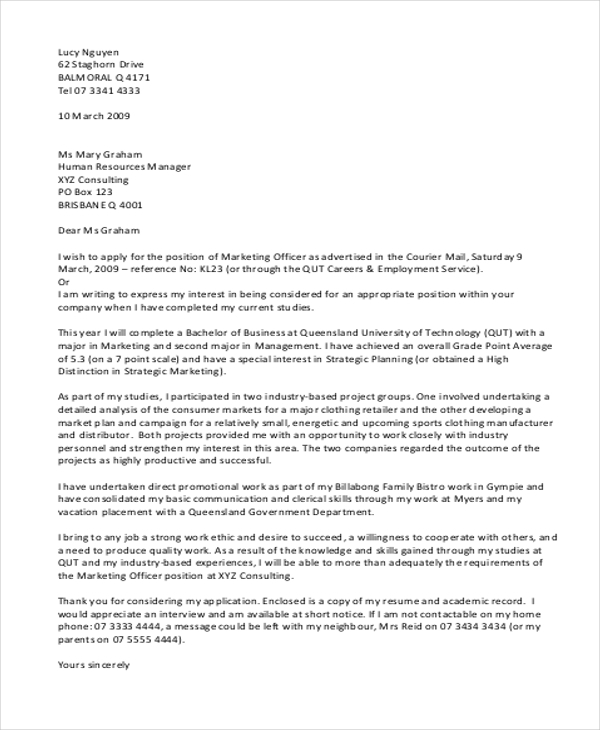 If you have never written a job application before, you will find this letter quite helpful. The purpose of the letter is to guide by giving an overview of the format of a standard letter as well as the sample content. 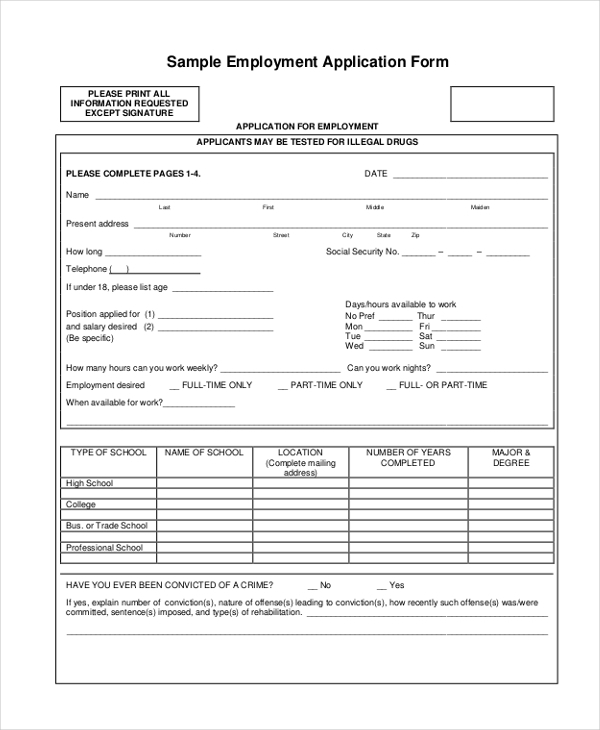 Did you know you can use an Employment Application Forms document to write a compelling job application file? This document is a good example of the best job application files that will get you a job for sure. 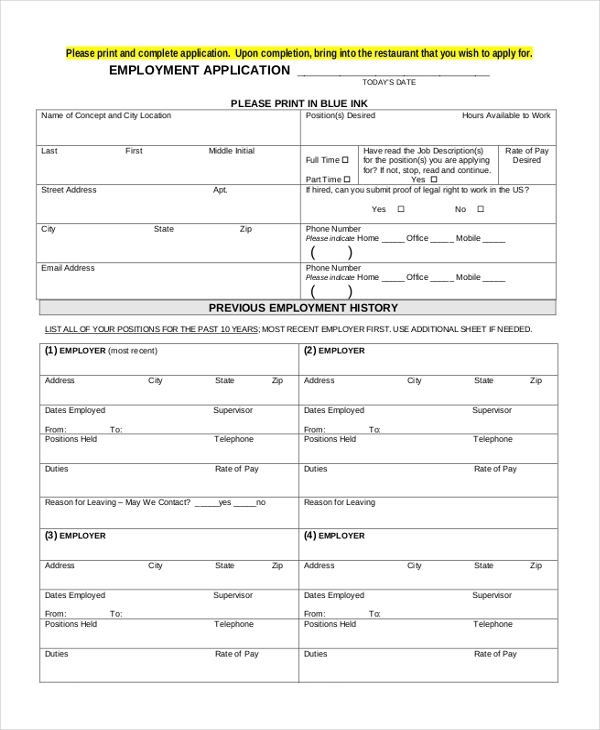 If you are looking for a standard template that you can print and use for a job application, you will definitely find this file useful. It is free to download, ready for print and quite easy to customize. The first thing you do when you see a job post that interests you is to send an application to the hiring Manager. 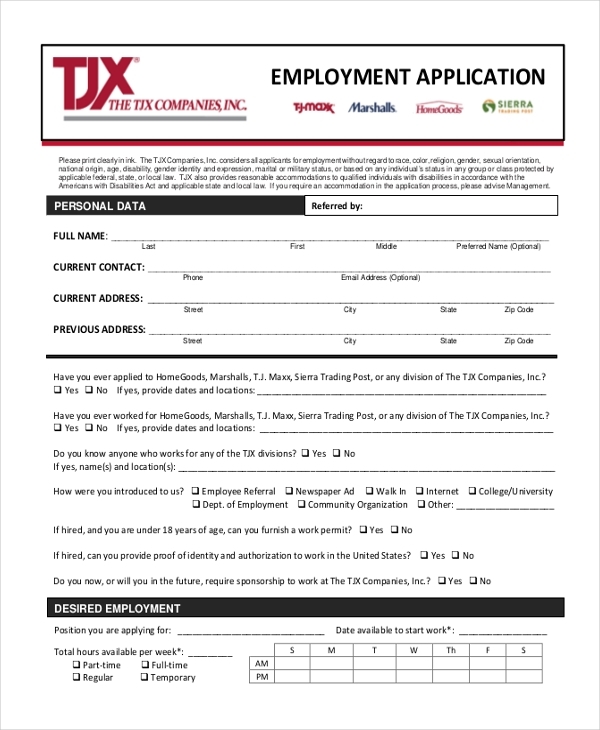 You can use this sample document to help you write an industry-standard job application document. 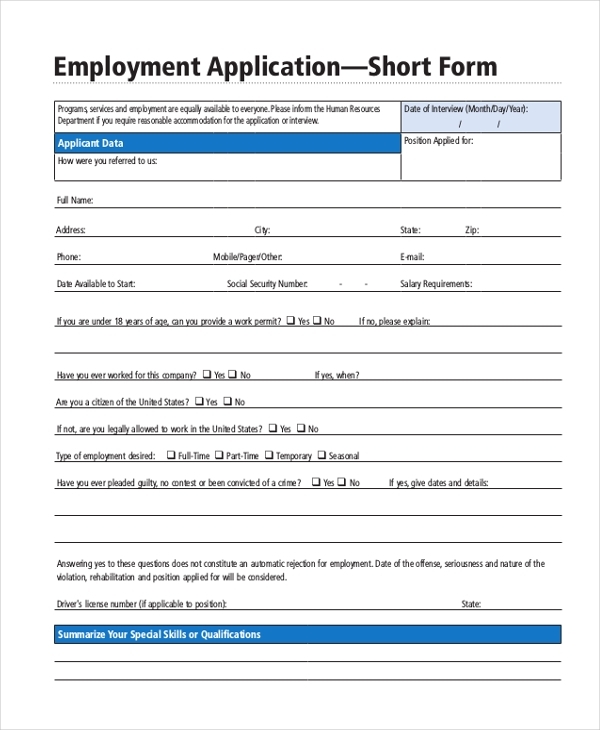 Although you can create an Employment Application Forms yourself, you should consider an already built template to help you save time. That means this file is quite useful for the job application. 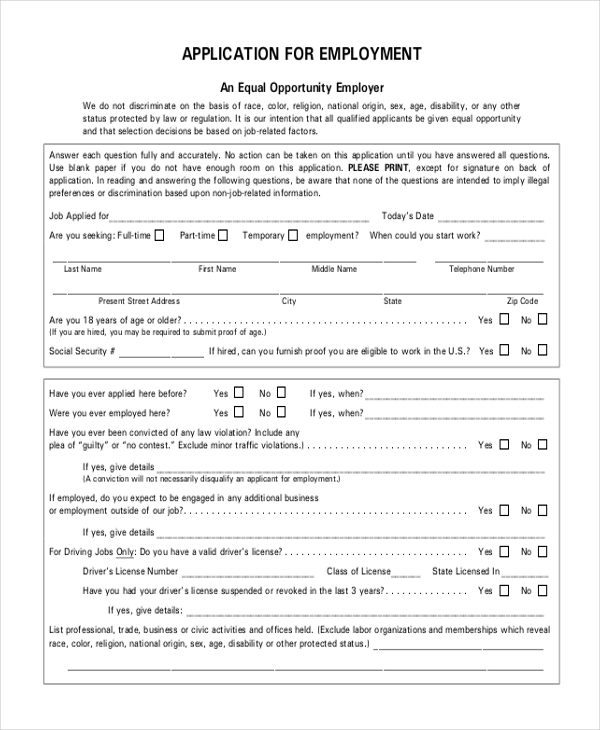 If you are a potential employee living in the city of Maryland, and you are looking for a job, you can use this sample file to express your interest in a job opening. You can download the file for free. 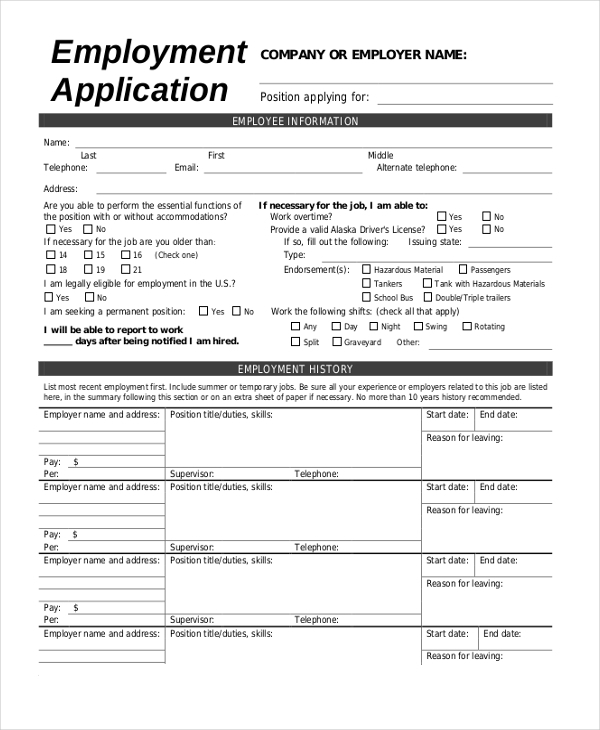 If you want to be a good employee in a restaurant, you can use this sample application form to express your interest in a job opening advertised on papers or in street posters. If you are an employee who’d rather work on hourly payment plans, you will find this template useful for sure. Use this when applying for a job that requires employees that can work on hourly payment plans. It is possible to apply for a job, even when you are still a student at the university. 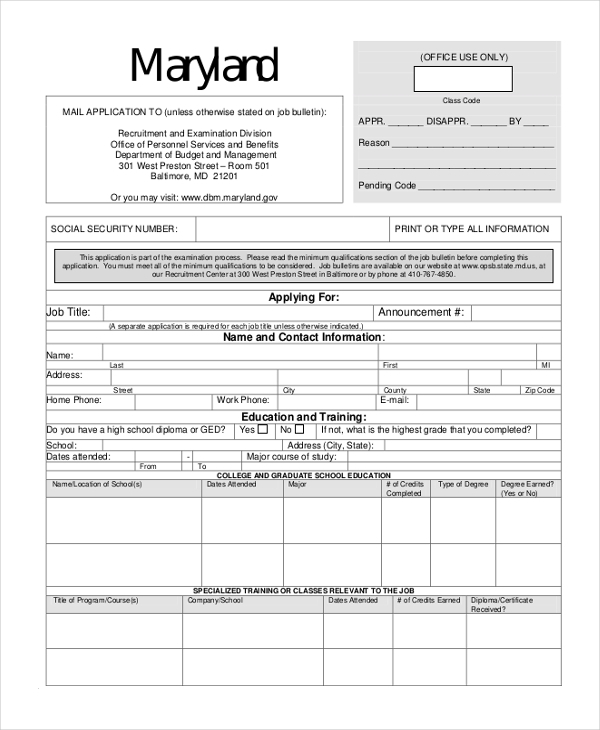 All you have to do is use this form to express your interest in a job that you would like to do before you finish school. There are many ways by which you can get this form, and the most obvious means is to download the template for free. You can customize the template to suit your very own standards, but the format is already suitable for job application. This file is perfect for anyone who is looking for any job. It is general in the sense that both the expressed and those looking for industry experience can use it for job applications. Who Should Use These Employment Application Forms and Letters? 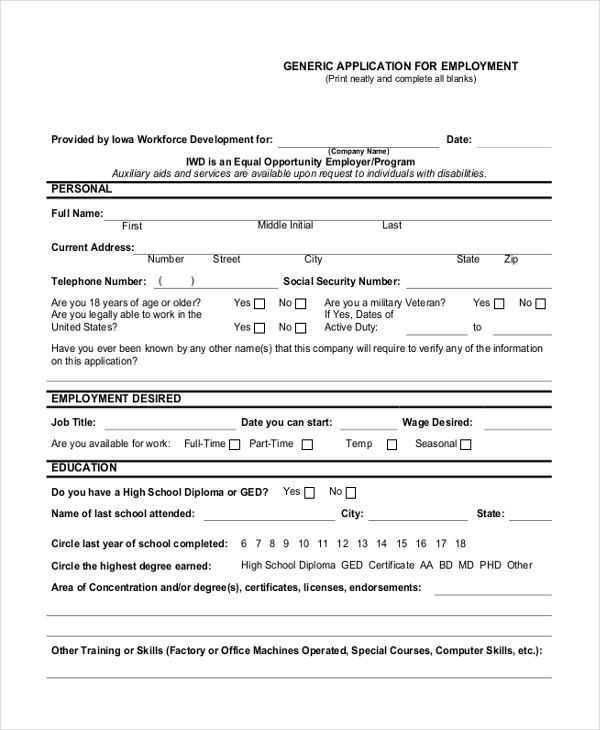 A job application document is an important file designed for three people: new job seekers, job seekers with industry experience, and students. New job seekers can use the templates to experience their interest in a job worth their skills, energy, and time. Employees with industry experience can use the forms to express their interest in a similar job but in different companies. So, if you have the experience needed to work in a particular industry and you want to change workplaces, these are the best forms to use. 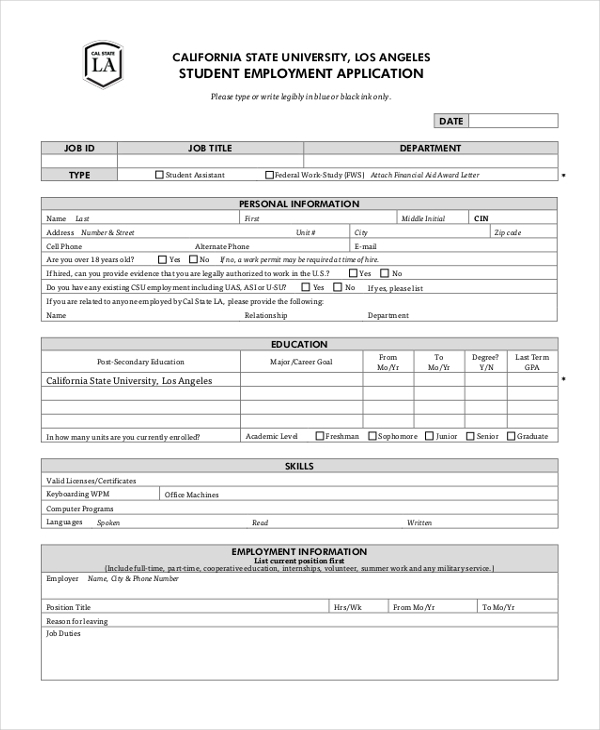 Students can use the forms to apply for part time jobs. What are The Benefits of the Employment Forms? First, people who have never written job applications before may have a difficult time writing their application letters. Luckily, these files may help them write their application letters better and increase their chances of landing a better job. Generally, the files help job seekers to write standard job applications that are acceptable in the job market today. The files are free to download. You can start using these templates as soon as you download them. They are also easy to edit in Word and Adobe Acrobat. You may also see General Application Forms. Getting a job is not always hard, employers are often looking for the best letters of application that describe what you bring to the table. You can use these templates to describe your experiences, your skills, and your accomplishments. If you are ready to apply for a new job, you can use any of these files.